Dark Horse expands it’s Creepy and Eerie franchise with another single artist anthology. This time Steve Ditko’s post Marvel works for Warren are the focus. Ditko’s outre dimensional pastiches, informed by equal parts Salvador Dali, MC Escher and H.P. Lovecraft, perfectly lent themselves to these titles as did his idiosyncratic, angular, take on human form and his faces imbued with hysteria and madness. Fans of Marvel’s Dr. Strange will instantly feel at home in the signature prismatic dreamscapes, and faces subtly conjure Peter Parker, J. Jonah Jameson, Sandman, Dormamu, and other Ditko rendered characters. 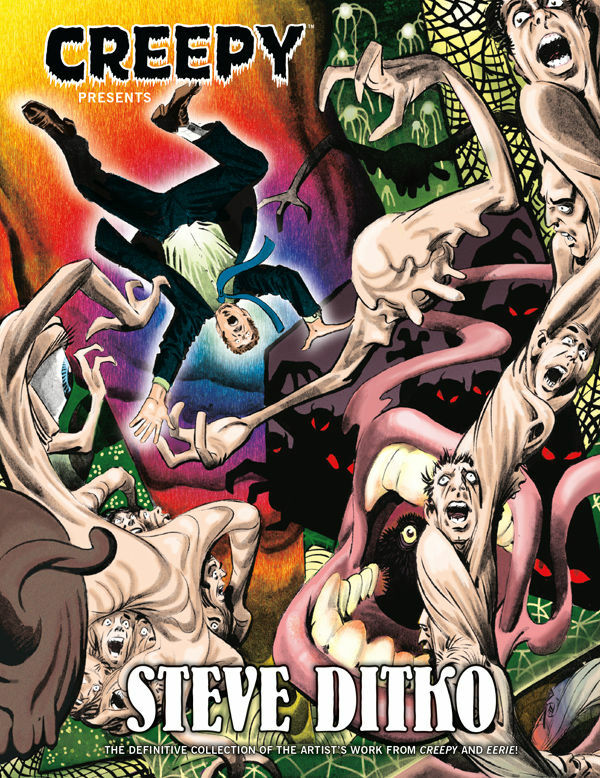 Where Dark Horse’s previous anthologies featuring Richard Corben and Bernie Wrightson give readers a view to each artist’s growth, Ditko came to Warren fully formed in the panel art field. In this tome we get an interesting look at the artist weening himself away from strict black and white line work required for color comics to form filling ink washes, crosshatching and zip-a-tone sheeting. The forward by Mark Evanier (Kirby, King of Comics) draws historic attention to the circumstances that led to Ditko’s freelance Warren strips, his work method, and aforementioned evolution in the solely black and white medium. That said it might have been more enlightening to group these stories in chronological order rather than a Creepy/Eerie title split. Considering at least one of these stories, “Demon Sword” was inspired by Frank Frazetta’s painting, an appendix of the cover art for each issue these appeared in would have been a nice addition. Not all of this works. To my taste Ditko was not specifically suited to several of the sword and sorcery derived yarns, although it is noted by Evanier that he pitched the genre to Goodwin. For example, his attacking vultures on the splash page of the Thane episode “City of Doom”, and the scorpion monster in “Where Sorcery Lives” are antagonists better suited to a more cartoon oriented setting, like Paul Coker Jr’s designs for Rankin and Bass productions. This visually enticing compendium was an instant time trip for me. I purchased all these stories one by one as issues of Creepy and Eerie hit the newsstand in their time and absorbed them thoroughly. In retrospect this body of work was pervasive in my discovery of the surrealist and Dada movements. What particularly struck me when I perused the review copy was how many of these panels had stayed with me. The visuals of black winged demons dragging a victim to a toothsome disembodied maw, the bulging orbs and sweat beaded brows, the Ditko hand gestures with splayed fingers poised in malocchio devil horns, all appear to be indelibly etched on my brain cells. Along with his extremely idiosyncratic work on the Gorgo and Konga film spin-off books this group of stories are my personal favorites in Ditko’s canon, and I highly recommend adding it to your art book collection. This hardcover edition is available for pre-order at $19.99.